We had some friends over the other day and played a “How well do you know ______?” game. We had 10 questions and each person had to answer for the other people in the room. One of the questions was “What is ______’s favorite food?” One of the people guessed “soup” for me. While the correct answer is “pizza,” I do enjoy a good soup. When I shared the Mapo Tofu recipe a few weeks ago, I invited folks to offer up their favorite recipes and I’d take a stab at making them with vegetarian ingredients. Cascadian Pugs sent me a recipe for Thai Coconut Soup. The original recipe came from St. Innocent Winery, a beautiful vineyard west of Salem, OR. With the exception of the chicken stock, the recipe was already vegetarian, but I tweaked it to utilize some of Japan’s local ingredients. 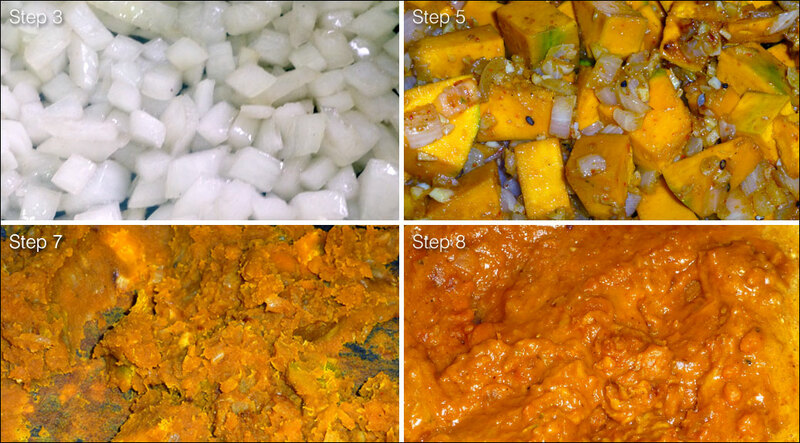 For example, the original recipe called for butternut squash, which I replaced with kabocha (Japanese pumpkin). Kabocha can be found in the U.S. (quite readily in Oregon) and are small-ish, green winter squash. They’re naturally sweet and make a great snack all by themselves when cooked. I also substituted the cayenne pepper for seven-spice chili powder (shichimi), which adds some unique flavors like orange peel and nori (dried seaweed) to the mix. This turned out fantastic! I halved the original recipe, only because I didn’t know how to convert the original 2.5 lbs. of butternut squash to grams at the grocery store. 🙂 This batch yielded two thick, hearty servings. If you like your soup a bit more “soupy,” you could stretch this to four servings by streaming in additional broth during the blending process to get the desired texture. Enjoy! Stages in the cooking process. In a large skillet or stock pot, heat 1 tablespoon of olive oil over medium heat. Add onions and cook for about two minutes until they begin to soften. Add the garlic and ginger. Cook and stir until the onions turn translucent. Add shichimi and 1/4 cup of the stock. Stir and bring to a boil. 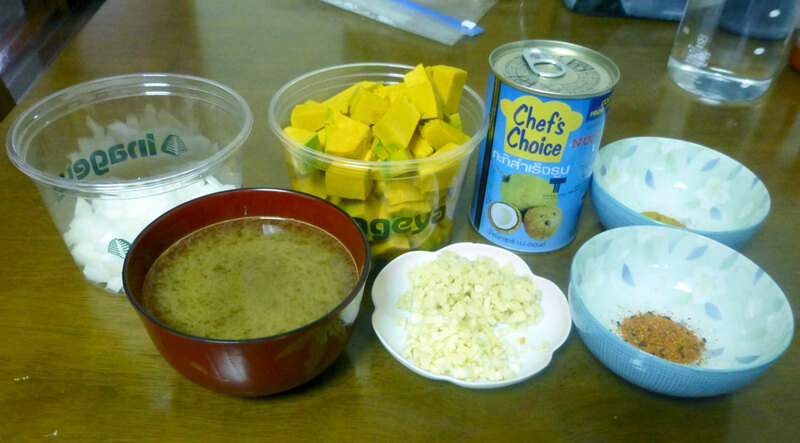 Stir in the kabocha, salt and curry powder. Cook for about 10 minutes, stirring every couple minutes. Add the rest of the stock and increase the heat to medium-high. Cover and bring to a boil. Lower the heat to medium-low and simmer for 20 minutes. Stir every five minutes, mashing the mixture each time until smooth. Add the coconut milk and simmer for another 10 minutes. Remove from heat and add to a blender, or use a stick blender, to puree the soup until smooth. Reheat and season with salt. Naan makes a nice side to this or, to add additional protein, you can cube firm tofu and serve the soup over the tofu. This recipe is also great cold, perfect for a summer meal. Great idea! My wife really loves Kabocha and must eat it every day. Maybe I’ll get points for making this for her. I see you are making use of some of those Japanese veggies that we Americans don’t know so well – good survival tactic!